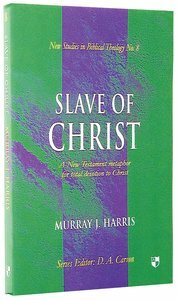 ^^In this study Murray J. Harris sets out to uncover what it means to be a slave of Christ. He begins by assessing the nature of actual slavery in the Greco-Roman world and the New Testament's attitude towards it. Drawing insights from this, he goes on to unfold the metaphor of slavery to Christ. Among the topics discussed are slavery and spiritual freedom, lordship, ownership, and privilege. ^^Slave of Christ is a model of good biblical theology, providing insights both for future study of the Bible and for practical application. About "Slave of Christ (New Studies In Biblical Theology Series)"
Murray J. Harris examines the grounds for believing that the follower of Jesus Christ is not only a disciple, son or daughter, or friend, but also a slave. His study begins with an assessment of the nature of slavery in the Greco-Roman world. Murray J. Harris (Ph.D., University of Manchester) is professor emeritus of New Testament exegesis and theology at Trinity Evangelical Divinity School, Deerfield, Illinois. He is the author of numerous studies of the New Testament, including From Grave to Glory: Resurrection in the New Testament, Jesus as God: The New Testament Use of Theos in Reference to Jesus, Three Crucial Questions about Jesus, Slave of Christ: A New Testament Metaphor for Total Devotion to Christ (Volume 8, New Studies in Biblical Theology), 2 Corinthians (for both The New International Commentary on the Greek New Testament and The Revised Expositer's Bible Commentary), and the volume on Colossians and Philemon (Exegetical Guide to the Greek New Testament series).